After reading the most current discussion on various methods of controlling potential oil starvation issues on the track, it seems there is varied opinion on the value of some of the deep sump systems. What I am trying to decide this season is whether or not to add a sump extension. My car is an 02 S, that is primarily street driven. I will do probably 3-5 HPDE days this season and run a fairly fast pace with Max Performance spec’ed street tires. The question is, is it worthwhile at this stage to add a deep sump setup, or just run it as is and make sure my oil levels are good etc? I use the Mantis Racing deep sump (2 litre) with windage tray for insurance. You are unlikely, however, to pull enough g’s on street tires to cause serious problems. Certain tracks are known to cause problems with long sweepers. You can research this. X-51 style baffles can add some insurance at a lower cost than deep sump. Another simple mod that many of us have done is adding oil pressure and temperature gauges. I learned, as you mention, that there are widely varying opinions on the subject which leaves many in the position of not knowing who to believe or what to do. I came to the conclusion that the X-51 baffle and changing the oil pressure spring & piston was all that was needed (stock oil pan) for track days in a street car on street tires. Eventually, I added a deep sump, 997 oil returns, and the horizontal baffle after upgrading to the Spec Boxster suspension, R- compound tires, and having improved my driving to where I was quite a bit faster (and pulling more g's). Stone, of course there are several versions of the upgraded baffle unit, all of which say they are "the best". 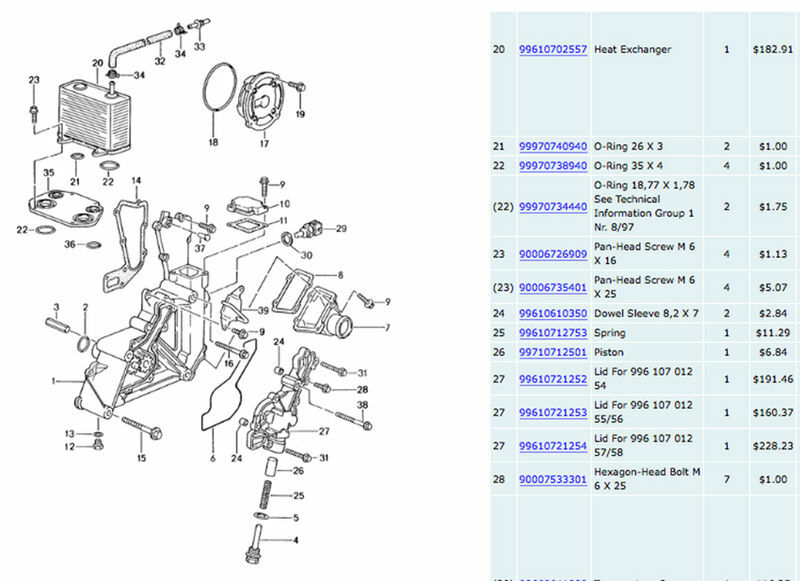 It looks like the one from Tarret, Oil Sump Baffle Kit, 986/987/996/997 makes sense. On the spring and piston, are you talking about the ones in the oil pump itself? Have a PN? On the oil pressure sensor, it looks as though the current sender has a single pole for the idiot light. 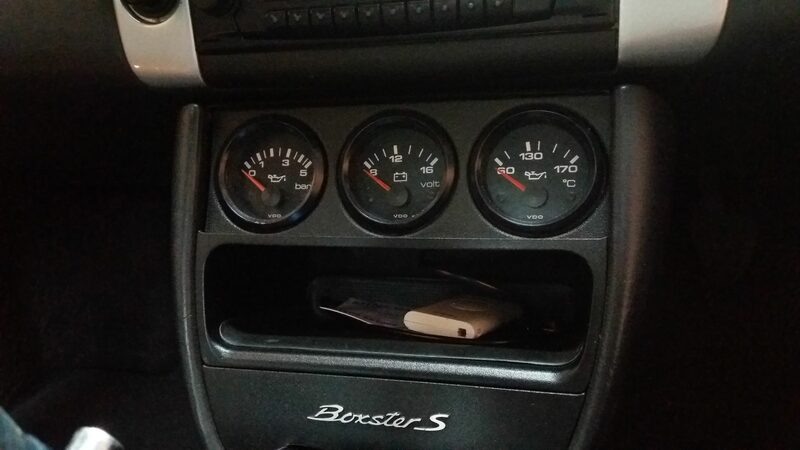 However, it appears the 996 sender has two poles, one for the idiot light, and on for the pressure gauge? Is that correct? Looks like a swap covers the electrics, any particular gauge preferred? Can the temp sensor be installed in the other bung on the other cam cover, or is there a special place for something like that? I installed guages and an X51 sump. The guages were a royal pita to wire and sort. Access is a nightmare! I used a 996 sender in stock location and the temp sensor in the other head. I believe the temp reads hot do to reading from the head. Yeah, I’ve read a good amount of that and still, there seems to varied opinion on the best overall system. I’ll go there if I ever get serious about a track car (been there done that in a 911) gets expensive! Not sure if I want to dive in that deep just yet! I like the idea of a pressure gauge for sure, the x51 baffle makes sense as well, just as a generally good upgrade. Anyone know the thread pitch of the stock sensor? I can’t seem to find it anywhere. And yet, another question. Any of you guys have some install pics? Trying to find some ideas. Adding a 996 dash seems like a massive pain, and pretty expensive. I'm trying to find ideas that aren't a simple bolt in hanger for the dial. Last edited by jimk04; 01-23-2018 at 01:40 AM. That looks good, but my console configuration is full, though I do have the tray above my A/C. I need to wait until I get the gauge and see what I can figure out. That central installation makes sense for sure. On the spring and piston, are you talking about the ones in the oil pump itself? Have a PN? Parts #25 and #26. The spring regulates the oil pressure. Some theorize that it loses tension over time. Relatively cheap and easy insurance. Installation: unscrew part #4 and replace #25/#26. Replace #4. It will take longer to get under the car than to actually do the swap. Thanks Stone, got the parts ordered. I am creating a "project pile" currently in the garage. Going to be a busy few days this spring! I suppose in a race car you would want them mounted higher for easier visibility. Ooh... So, I found this as a mounting solution for the oil pressure gauge. They also do a dual version.